Who’s been to visit our blog? 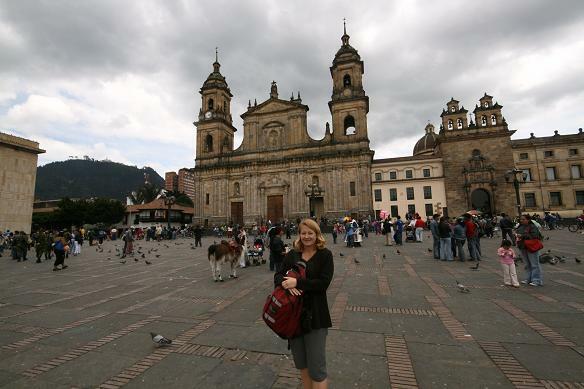 We arrived in Bogota the capital of Colombia on Saturday after a five and a half hour flight from SP. As soon as you arrive in Bogota, you know you are high – at 2,650 metres, Bogota is higher than any point in Australia (mount Koszciusko tops out at 2,228 metres), only 1,110 metres short of Mount Cook in New Zealand and 1,500 metres higher than Mount Snowdon in Wales. So as soon as you arrive here – you are high… for those of you who thought I might have been referring to the cocaine for which Colombia is infamous, I can tell you that apparently it’s as cheap as a beer, but it has caused so many 1000s of deaths and is still responsible for many of the problems that Colombia faces so no – we didn’t inhale!This was our first time at ‘altitude’ and initially it really took its toll, our hotel room was four stories up, but just trying to walk up those four flights of stairs proved to be a massive challenge, the air is so much thinner here, any type of exercise is really difficult, and both of us suffered from massive headaches, loss of balance and generally feeling like crap – our first and hopefully last encounter of altitude sickness….Bogota is also cold, 14-20 degrees every day – never more never less – the same temperature all year round, this minor fact was a bit of an oversight on our parts – we packed a little light, the weather is more like England in Autumn than you would expect being so close to the equator. Before coming to Colombia, the only things we knew that came from the country were emeralds, the Escobar drug cartel, Juan Pablo Montoya and coffee. But it doesn’t take long to realise that this is a country on its way up, Bogota with a population of 7,500,000 is one massive building site, new apartments, shopping centres and buildings are being built everywhere, and the country is enjoying one of the longest, most stable periods in its fairly bloody history. Cath in the main square. 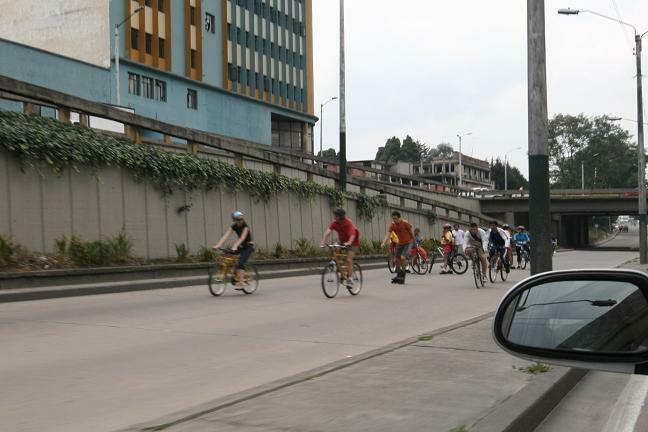 Bogota is becoming something of a model city – not just in South America, but for the world, and we were lucky enough to see one of the most radical programmes they have put in place in the city – on Sundays from 7am till 2pm 110km of the cities roads (including several motorways) are closed to motorised traffic and opened to any other form of traffic. The city literally bursts into activity, cycle races, rollerbladers, walkers, runners and even middle of the road aerobics class fill the city with people in an amazing display of health and community spirit. Even when the roads are not closed the city still has to have the most kilometres of cycles paths we have ever seen, there is a cycle path to the airport which is apparently quite popular with travellers, but I think with our luggage we will stick to the cheap and cheerful taxis. So there are lots of things to do in Colombia, but top of anyone’s list has to be the Museum of Gold and the Cathedral of Salt – unfortunately the museum was closed for renovations (doh)! 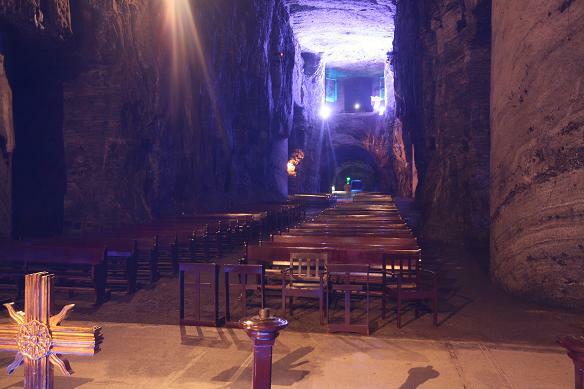 But the Cathedral built in the salt mines about 100km north of the city was absolutely amazing… The Cathedral seats over 5,000 people, it is the second one to be built in the mines and was finished in 1995 and is staggeringly large and beautiful. 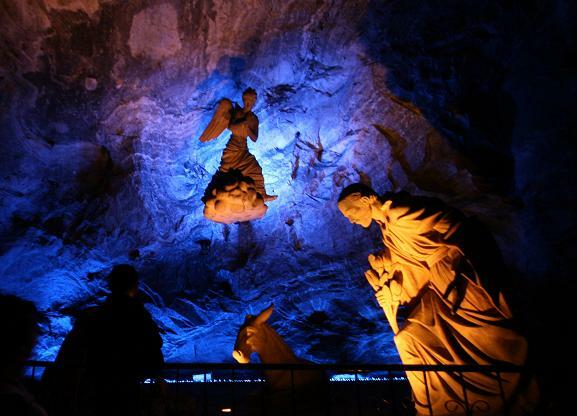 The walls are almost 90% salt – I know cos I licked them to test it out, and the mine is still a working mine – 800 tonnes of salt are extracted each night after the tourists go home. Another must do on our time here was to visit ‘the worlds’ best restaurant and bar’ – now usually when you are told something is going to be amazing, it usually ends up disappointing, but Andres Carne De Res just north of Bogota in Chia – proved true to its reputation – its very hard to describe, the decor is completely mental – collections of the weirdest stuff you can imagine, handmade objects (some arty – some not so arty) stuffed into every nook and cranny – and its massive – it probably seats 800 people – the people are also stuffed into nooks and crannys – up half a flight of stairs, round a snail shaped hallway, over a little bridge, then you find your table, nestled between a collection of car parts and vases made of broken glass…. and they serve food! Thanks Gio for the tip. 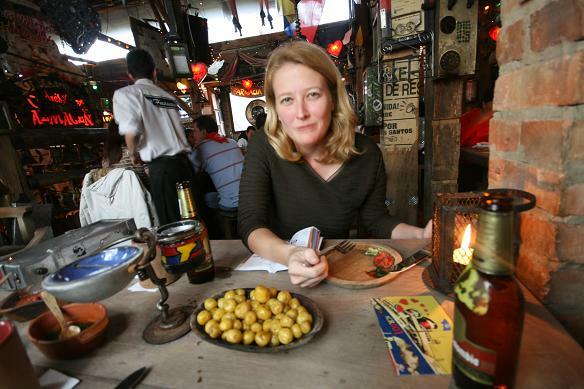 Cath eating the famous Colombian mini potatoes. The Colombian hospitality has been tremendous, from the people in the street – helping Greg when he gets lost, waiters in restaurants, Caths workmates and everyone else we have met have been really friendly and very welcoming – if we keep eating out at the rate we have here we will turn into a couple of very large pieces of South American steak before we get home! 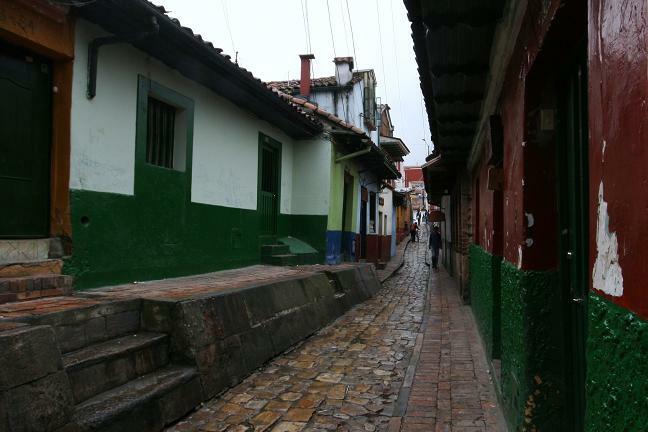 So while Cath is at work Greg has spent his time wandering around Bogota – its a mix of European style areas of really nice houses and apartment buildings, a big area of beautiful colonial area houses and shops, and lots of bits in between – like any South American city, the city is surrounded by large shanty towns – where most of the city’s residents live, but with the continued focus on education and health in Colombia at the moment, it seems like life is getting better for most Colombians. Tomorrow we are off to Venezuela – from what we have heard from the Colombians life is getting worse for most people in Venezuela, so it’s going to be really interesting to step into the land of president Chavez and see if the view we get from the outside of his presidency are the same on the ground…. 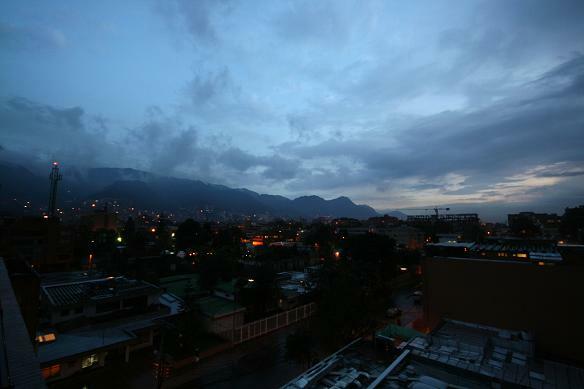 So till Caracas – see ya!